One of the difficulties many people have with blogging or general web content is facing a blank screen, not knowing what to write. The answer to that is planning. However, some people find it difficult to plan. For a start there is the issue of when to write, or what content to produce and how you might use keywords. It all gets too confusing. 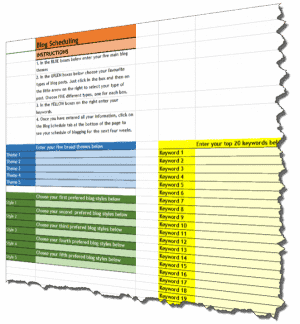 This spreadsheet tool – yours free of charge – enables you to enter some basic information, such as your Top 20 keywords and the styles of blogging you prefer and then “hey presto” it produces a details plan of what you should write about – and when. The tool covers a whole month, so all you need is to enter the information at the beginning of each month and you will have a schedule of blog posts for the next four weeks. The spreadsheet prevents your blog from looking too formulaic by “mixing up” the styles of blog posts and the themes your content will follow. As a result, your weekly blog posts and content pattern looks varied to your audience – precisely what you want. So stop worrying about what to add to your blog and when – just download this spreadsheet (Excel format) and spend a few minutes entering the basic information and you’ll be blogging happily.